Why Use Our Auto Hail & Dent Repair? Because we are an advanced auto body shop specializing in auto hail removal. We use advanced auto body techniques (paintless dent repair) to remove hail damaged dents with no depreciation to your car. Our methods will not damage your vehicle’s factory paint. Our paintless dent repair technicians are top of the line and our customer service staff really does care about your hail damage situation. With our many locations and countless partners we provide the most convenient approach to hail damage restoration by working with you. With over two decades of repairing hail on vehicles, we are very quick and precise at our hail damage restoration. All our locations in the Denver Metro area use cutting-edge auto body technology to repair even severe auto hail damage. Honest – Completely honest and sincere. Reliable – On time each and every time. Efficient – Decades of hail repair experience. Modern – Ahead of the curve with technology. Paintless dent repair is also known as PDR. It is the skill of removing dents from vehicles without the use of any paint, fillers, or tricks. The technician meticulously pushes the dent from the opposite end that it came in. To do this we remove and replace parts to access the back of the dent. The technician then pushes the dent out point by point until the dent is essentially re-sculpted back to it’s original contour. This takes many years of practice and just like art the skill is not guaranteed with practice as many people that attempt to learn PDR simply never get it no matter how many years they try. To get to the back of the hail dent’s there is a specialized process of removing parts and obstructions from the vehicle so that the PDR technician can get to the back of the dents. Vehicles are not created equal and the R&I technician is an integral part of a proper repair. It’s necessary to have a specialist on hand that knows the inner workings of many makes and models. We only work with seasoned professionals that can do the job as good as the factory did it to begin with. To do this job right one must have thousands of hours working at manufacturing plants to know the inner workings of each vehicle. Unfortunately, most body shops and PDR locations just hire anyone off the street to do this job and you get what you pay for. Here at DentPass we take pride in every aspect of the repair process and that is why we use only the best R&I technicians with the proper experience and ongoing training. Hail damage is covered under your comprehensive policy. This type of claim will not count against you because it’s considered an act of nature. You don’t need to worry about your insurance premiums going up. The hail restoration process starts out by calling your insurance company and starting a claim. Your insurance will ask you when and where the hail catastrophe happened. The insurance adjuster will then set up a time for you to bring it to one of their locations or they will schedule a field estimate. Once your initial estimate is done, give us a call and we can take it from there. After your insurance has done an initial estimate it is time to get to work. We will first go over the estimate one more time to make sure that nothing was missed or overlooked. The R&I technician removes all the parts in the way such as headlights, taillights, truck, hood, headliner, etc. The PDR technician will then begin his work on the vehicle. When the vehicle is complete, it is re-inspected by our quality control experts to make sure nothing was missed. We then thoroughly clean the vehicle inside and out getting it ready for delivery. PDR is a highly skilled craft sought after by car enthusiasts because it’s the only method of repair that will not damage the value of your vehicle. Body shops will not replicate the factory paint job on your car because It’s impractical for them. Auto body shops will often replace hail damaged parts with after market parts to save time & money. We do what is right for your vehicle! Keeping your original parts is the best method of repair. There is no paint like factory paint so, we will only paint your vehicle if there is cracked paint and/or we replace panels we absolutely must. You Only Get One Factory Finish…You Can Trust Us With It! We take pride in every job and strive for perfection on every vehicle. SERVICE – Our dent removal and procedures are tried and true; perfected over decades of professional experience. We don’t cut corners or compromise quality. You can rest assured that you are getting the best possible hail repair. MASTERY – Paintless dent repair is our passion and we take it very seriously. Constantly improving our craft, always seeking to improve our skills with ongoing training, research, and cutting-edge tools. CLEAN – The paintless dent removal process is the cleanest hail repair possible. With no paint, sanding, or fillers our repair process will leave your car looking better than when it came in. STREAMLINE – Our highly experienced technicians can repair bad hail damage in a fraction of the time it takes conventional body shops. Hard work, modern technology, and cutting-edge tools are key. GUARANTEED – We take pride, and special care for your vehicle better than we would our own. Our dent repair is backed by a 100% lifetime guarantee because we leave your car better than before the hail/damage. 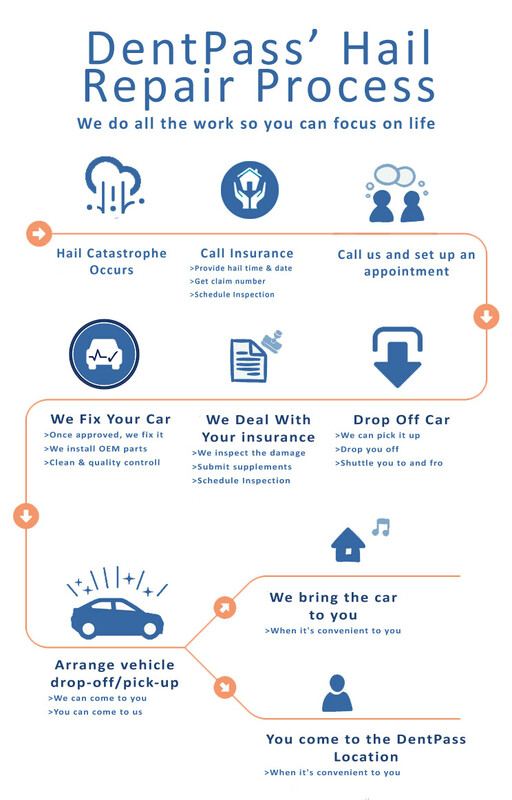 CHOICE – We know that every situation is not the same and we provide you with options that will allow you to get the most out of your hail damage claim situation. Will A Hail Claim Raise My Premiums? NO – Hail is covered under your comprehensive insurance and considered an act of nature so it will not raise your premiums. Will PDR Harm My Paint? NO – Paintless dent repair is the preferred method of by all professionals repair because it will not harm your factory paint or finish. How Long Does PDR Take For Hail? NOT LONG – Compared to conventional repairs, paintless dent repair takes about 1/3 of the time it takes a body shop to finish the same repairs. Will PDR Harm The Value Of My Car? NO – In-fact: PDR is the only method of dent removal that will not harm the value of your vehicle in any way, at all. MAYBE – In some cases we can cover your rental. Some people do have rental without knowing it so check with your insurance company. Will You Cover My Deductible? ??? – We can work with you in order to help you keep costs to a minimum or none. In order to stay out of the grey area when it comes to deductibles we can help you with it if you can help us. We pay our customers enough $ to cover their deductibles. Can Heavy Hail Be Repaired With PDR? YES – Any type of hail damage can be repaired by PDR accept if the paint is cracked then there will have to be a combination repair done that will involve some conventional repair but a combo repair is far superior to a strictly conventional repair. Is Your Paint Job As Good As The Factory Finish? NO – Any body shop that tells you that they can do as good of a job as the factory finish is not telling you the whole truth, unless they plan on fully disassembling your car first. Our painters are very good at what they do but there is no way to replicate a 9 stage process that the factories go through. The factories have no electronics and interior to worry about so they can dip your car in acid, electrify the metal and bake it at an extreme temperatures that would melt everything that isn’t metal. That is why we advise that you go with paintless dent repair, because you will save your factory finish and therefore preserve the great paint-job the factory wen’t through so much to accomplish. Have you talked to your insurance company & filed a hail claim? We service the following cities when it comes to hail repair. If you are in need of conventional repair, painting, or damage that exceeds the scope of PDR then you will have to come to us. But if you are in any of these cities and need some assistance with your hail damage then we can help get you to and from our location nearest to you. Littleton Centennial, Highlands Ranch, Denver, Aurora, Brighton, Broomfield, Castle Pines, Canon City, Castle Rock, Castle Pines, Commerce City, Colorado Springs, Englewood, Florence, Fort Carson, Fountain, Glendale, Greeley, Greenwood Village, Lakewood, U.S. Air Force Academy, Pueblo, Pueblo West, Superior, Thornton, Windsor, and more!